This fall I had the privilege of learning about the relationship between Rabbi Abraham Joshua Heschel and Rev. Dr. Martin Luther King Jr. at the Reconstructionist Rabbinical College. I was excited for the opportunity to learn about these two men. I had heard for many years that blacks and Jews worked together on civil rights and at one time the two groups were close. Having heard this for most of my adult life and seeing little evidence of it except in the relationship of King and Heschel and a few other well documented relationships I started to wonder if it were really true. Now I had the opportunity to learn about two men, one black, one Jewish, both religious leaders. Once the class was over I had the additional responsibility to teach what I had learned to a diverse synagogue in West Philadelphia on the weekend of the King Holiday. I had the honor of teaching the class, not just on the weekend of the King holiday but also when Jews are reading about the Exodus, freedom and the first Passover. 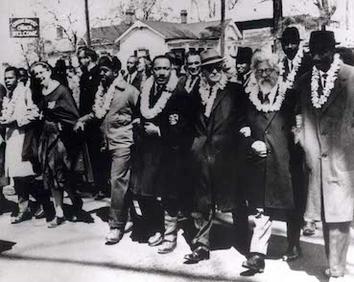 First I passed out the iconic photo of Heschel and King marching arm and arm in Selma. Many of us know about this photo but I asked the adults in the room if they recognized the photo, some did but some did not. I then preceded to tell them about the marches in Selma, Alabama in 1965. And when that famous photo was taken it was the third attempt to March from Selma to Montgomery, Alabama for voting rights. I talked about Bloody Sunday when several hundred civil rights marchers were attacked and beaten by local police and not allowed to march to Selma. 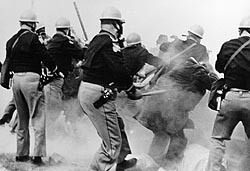 Alabama state troopers attack civil-rights demonstrators outside Selma, Alabama, on Bloody Sunday, March 7, 1965. The Selma protest organizers called in King for help, and with King’s help organized a second march which was held while waiting to get court approval for the group to march. With King’s help the courts got involved and soon the same police that beat the protesters the first time were ordered to protect the marchers as they left Selma. That photo of King and Heschel arm and arm has come to symbolize the great moment of symbiosis between and blacks and jews. Then I shifted to “But how did they meet? I explained that King and Heschel met at the 1963 Conference on Religion and Race in Chicago, and after hearing King speak, Heschel wrote in his journal that the “Soul of Judaism is at stake in the civil rights movement.” The relationship between these two men was a genuine friendship of affection as well as a relationship of two colleagues working together in political causes. I told the group that what I considered remarkable about their relationship is these were two men with very different backgrounds; Heschel, who was saved from Hitler’s Europe by Americans, was born into a Hasidic Rabbi’s family in Warsaw, he wore a long white beard and Kippah. He escaped the Nazi death camps by just a few weeks. King came from a conservative black church tradition in the segregated American south. Both men came from prominent religious families and were, in my opinion, groomed to take up the mantle of leadership in their communities. Both men believed in a God of compassion and righteousness and both men demanded that America live up to it’s ideals of being a nation for all people not just white Americans. These two men were connected by the prophets and the Exodus story. Both of these great leaders preached about the Exodus story. I explained that King, like the American slaves before him connected with the Exodus story and saw the Exodus story as their own story of slavery and redemption. King and the U.S. Civil Rights Movement saw themselves also embodying the Exodus: The Israelites were the black American slaves and in King’s time struggling for equality and the end of segregation. And Pharaoh was the oppressive segregated and racist American society. In King’s speeches we can hear how King saw himself as a Moses-like figure. In King’s last speech he sounds like Moses “I’ve been to the mountaintop. He’s allowed me to go up to the mountain. And I’ve looked over and I’ve seen the Promised Land. I may not get there with you. But I want you to know tonight that we, as a people, will get to the Promised Land.” And like Moses, King was allowed to see the promised land but he knew that he was not going to be allowed to enter. The next day King was dead. Heschel in his speeches also likened black Americans to the Israelite slaves, and Pharaoh to an oppressive white America. As the Reconstructionist movement’s only black rabbinical student I have trouble putting into words the effect teaching this class had on me. It reminded me of why I came to rabbinical school; to educate. 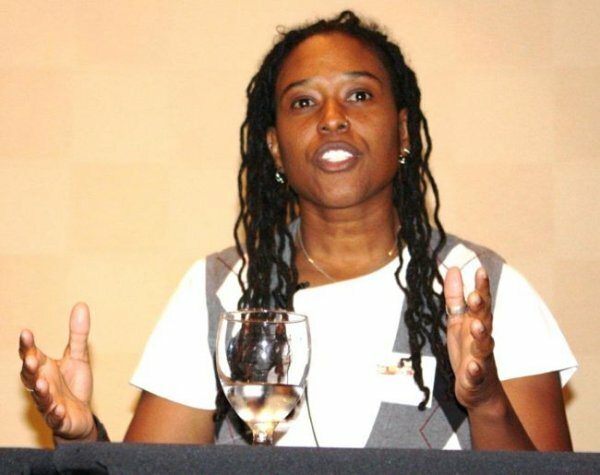 Here I am a black person, a Jew, telling the story of King and Heschel. I am someone who embodies both the dream of King and Heschel. And I want to see a future where blacks and Jews work together, and I want to help make the world a better place for all. Last Sunday I was a paid cooperative at the Weaver’s way Coop. For those of you that do not know a paid cooperative is a member of the Co-op who is paid to work and I’m guessing it’s because the store did not get any members to volunteer for a particular shift. It’s pretty chilled work and working there is kind of cool especially after a long week or day of rabbinical school. My shift started at 7:30 in the morning about an hour and half before the store opened. I was assigned to bakery duty. They ordered a ton of bread that day and my job was to sort it, price it and put it in it’s proper place. As I was putting rolls, bagels, baguettes and buns in their proper places it dawned on me that next Sunday will be Pesach. This got me to thinking, if they call me next Sunday morning to work and they want me to work in the bakery, can I? The over whelming answer that I found was no. So the mere handling of chametz is also forbidden? To remove all chametz from one’s home, including things made with chametz, before the first day of Passover. (Exodus 12:15). To refrain from eating chametz or mixtures containing chametz during Passover. (Exodus 13:3, Exodus 12:20, Deuteronomy 16:3). Not to possess chametz in one’s domain (i.e. home, office, car, etc.) during Passover (Exodus 12:19, Deuteronomy 16:4). This is something that I had not thought of before. One of the reasons that I work at the Co-op is for spending money. The money I make there will not make me rich, it will not pay my bills, but every time I work there I get cash and it keeps me from going into my own bank account. As I started putting the bread away I wondered what if this were my real Job or your real job and I was just an hourly employee with no paid vacation time, no union and basically could not afford to take a week off from work? What would I do? What would you do? I started to wonder if these laws really work in today’s society. I have never been one of those Jews that was worried about my food. I mean, sure I refrain from eating chametz but for me, I had always thought about Passover being about freedom and redemption not about chametz being near me. I talked to a rabbi friend of mine and she told me to look at the prosbul. To me this initially sounded like some kind of sporting event. The Torah mandates a Sabbatical year, known as Shmita, every seventh year. During the Shmita year all debts are cancelled. This is one of the many laws in the Torah meant to protect the poor and disadvantaged, affording them a chance to escape from eternal debt. In chapter 15 of D’varim the Torah teaches us that part of the observance of the sabbatical year must include forgiveness of loans made to fellow Jews. And G-d also warns us that, as this year approaches, we should not refuse loans to our poor brothers and sisters because this would be viewed by God as a sin. The wealthy refused to loan money during the latter years of the seven year cycle refusing the poor even a temporary opportunity to make ends meet. The rabbis, under the guidance of Hillel created a legal loophole in Jewish law. The Rabbis enacted a rabbinic exception to Jewish Law in which a loans were to be transferred to the courts as the law of remission does not apply to loans within the public domain, and lenders knew their money was safe even following the Sabbatical year, and they were likely to loan to the poor. Could we do this today? Why? Why not? I ask because Pesach for many families creates additional burdens, and families incur additional cost and my concern is with how the custom of worrying about food changes the experience of Pesach from what the Torah envisioned both practically and ideologically. In this country, most Ashkenazi Jews are forced to change their purchasing patterns to a much greater extent than the original law required. For example, high fructose corn syrup, because this ingredient is in so many products many Jews buy special forms, of products at extra cost, that without this custom could be permitted in their usual forms. I wonder have we changed the experience of Pesach from what God ordained in the desert and if the rabbis could change one Torah law, to benefit the poor can we change another law that is mandated in the Torah?